Richard Harold Dyas was born on October 16, 1924, in Andrew, Iowa, the son of Roy William and Mary Elizabeth (Weirick) Dyas. He grew up on his family’s farm, graduated from Andrew High School in 1942, and served in the Air Force as a navigator during World War II. Following his military service, Richard attended Iowa State University and earned bachelor and master degrees in education and psychology. 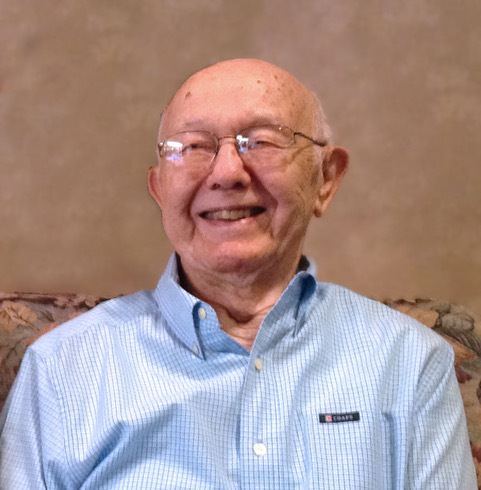 Richard had a long career as a highly regarded teacher and counselor, having taught in Jordan and Ellsworth prior to moving to Eagle Grove in 1958. He was the guidance counselor and taught psychology for both the high school and junior college until 1967 when he became the counselor for Iowa Central Community College in Eagle Grove. He was also the Coordinator for the Eagle Grove campus for seven years before he retired in 1987. He was united in marriage to Annis McCart on July 23, 1950 at the Methodist Church in Eagle Grove and they shared 68 years together until Annis’ death last month. They lived in Ames and Jewell prior to Eagle Grove. Richard was an active member of the community, including his involvement with Lions Club, Dollars for Scholars and as a member of the United Methodist Church. Richard passed away on Sunday, February 3, 2019, at Rotary Senior Living, at the age of 94 years. He was preceded in death by his parents, wife Annis McCart Dyas, and brothers Thomas and Robert. He is survived by daughter, Sue Johenning (Jeb) of Beverly Hills, CA; son, Jim Dyas of Lincoln, NE; grandchildren, Jimmy Johenning (Meghan) of Los Angeles, CA, and Sara Johenning of New York, NY; brother John W. Dyas of Andrew, IA; nephews Richard Dyas, Willard Dyas and John R. Dyas, and niece Sandra Dyas. Memorial services will be held at a later date in March. In lieu of flowers, the family requests memorials be directed to the Eagle Grove United Methodist Church.